It closely resembles Pure's own RV40 - minus a few features, that is. Absent from the DX40 is Pure's pause/rewind feature called ReVu, although it does include the Intellitext function. Intellitext means that it's possible to read bitesize news, DJ playlists and other info from the DAB station that's tuned in, typically broadcast by the BBC stations, at any time. There's also TextSCAN, whereby it's possible to scan through the scrolling text increasingly broadcast by most DAB stations. There are fewer presets on this incarnation - 16 in total for either DAB or FM - but that's expected for a budget model. Also coming as no surprise is the graphite finish and general lack of style, including a bullet-hole speaker grille that suffers from the all-round disappointing build quality. The placement of all the command buttons on the ridge of the DAB radio is one of the main build quality offenders, as the LCD screen is tiny and the buttons are rendered too small for anyone with sausage fingers. Still, we discovered that operation of the DAB tuner is simple enough. The autotune facility works fast, and scrolling between stations is typical Pure - simple and quick. The FM band has RDS, which means that stations names are presented on the LCD screen instead of just random frequencies. Connectivity is basic but, at least the DX40 is portable. There's an option to buy a ChargePAK, basically a rechargeable battery, for around £30, or use six 'C' batteries. These options will give you up to 10hrs of DAB. There's also a USB input, something that's fast becoming a trademark of all Pure radios. Sadly, it can't help in transferring MP3 files or similar to the DX40, and proves to be for nothing more than upgrading the software from Pure's website in the future. Given the radio's basic nature, there's fat chance of that. Our biggest bugbear is the sound, especially since we've heard Pure Digital's DAB radios work wonders with just a mono speaker. And despite the DX40's stereo speakers, music from DAB radio stations such as BBC 6 Music or Virgin simply sounds flat, weak and tinny. Even voice radio suffers from a distinct lack of gravitas. Put simply, this among Pure Digital's cheapest and most basic DAB units to date. And despite the general lack of excitement it generates, it proves to be a reliable, if limited performer. Unfortunately, what the Pure Élan DX40 has in unnecessary features, it lacks in sound quality - that's not a trade-off most are prepared to suffer. 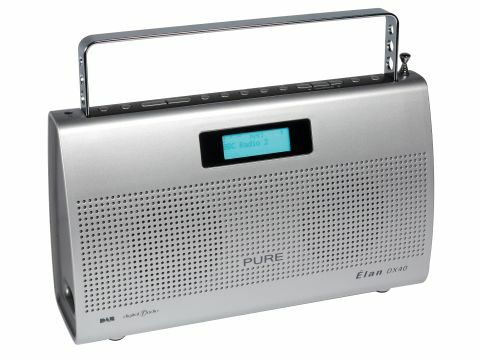 Pure has yet to better its £50 One for the budget DAB radio crown.